Chevy Silverado 2500hd classic great truck. I have a 2007 Chevy Silverado 2500hd classic with the 6. 6 lbz Duramax engine. It also has the Allison 1000 transmission. It's a great truck especially if you take care of it with routine maintenance. The only problem with it like most Chevys is that the power steering is tied in with the brakes, and if your power steering goes out then you lose your brakes as well. 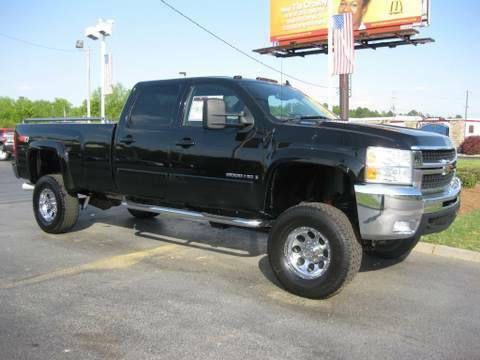 Duramax diesel with an Allison transmission will haul anything you want. My pickup has an Allison transmission in a Duramax diesel and a top-of-the-line sound system it is a crew cab with a lined bed liner new tires and a rebuilt engine with warranty it will take me anywhere and haul anything I want it to. It has a diesel engine and gets great gas mileage at 17 and a half mpg. Best and most reliable vehicle I have ever owned. I absolutely love my truck. It is extremely reliable, smooth driving, comfortable and big enough for our whole family, which include my husband and i, two children and two large dogs. The only real downfalls would have to be with it being a diesel, parts and fuel costs are much more than gas vehicles.